Difficult question Joan! I think it's probably not required if you're only inspired, but if you think that a small act like this might make someone feel good , I think it's always worth the effort! I, too, look at so many sources for inspiration, it is difficult to remember where the actual inspiration came from. I do try to acknowledge the inspiration specifically, but, having a human brain that is over 50, I don't always remember where. And I acknowledge that - "hey, I saw something in these colors last week, I can't find it again, but that is what fueled me to create this." I'm constantly inspired by everyone but when I'm inspired by one specific project, I do link them up. I suspect you'll find answers as different as the people who give them. I believe when you upload something to the internet, it's free for anyone to copy without giving credit. Having said that, I love it when I am named as someone's inspiration. Some people get very, very upset about this kind of thing, so it's probably good to try to give credit if you can. 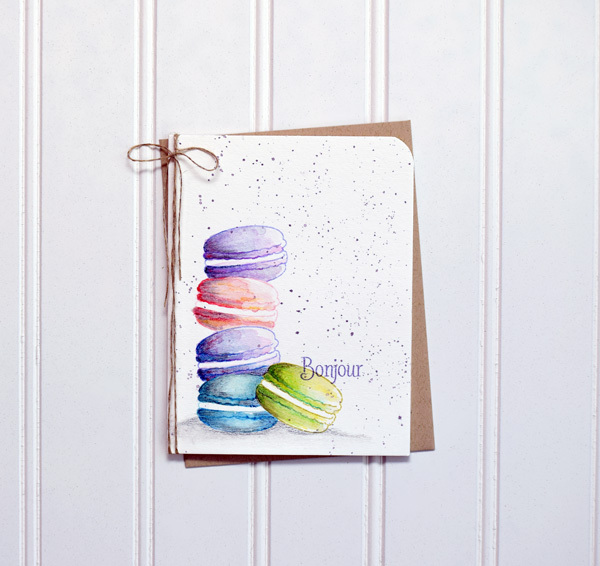 First, love the card with the colorful macarons! I see the similarity in colors, but not design. The colors are rather distinct, though, so I would think you'd want to give credit wherever you share it. I don't know why one public display would be different from another. I don't use all that social media -- only the blog and lightly Pinterest and very rarely SCS -- so I'm probably not a good one to offer an opinion. I would just think the ethics apply everywhere. In the case of Pinterest, the image is supposed to link back to your blog where you would have given credit in your post. Gorgeous coloring!!! You wouldn't believe how many projects I save but then when inspiration hits, I can't remember where I got it from. If I do, I try to say. :) Everyone inspires me all the time! Now I want to make a card with macarons! This is a gorgeous card! Love the colors you used. As for acknowledgement; I will always mention that I was inspired by someone else's card even if I can't remember exactly who, which card, and where on the web I saw it. If I can remember I do provide a link, as you do. But if not I just say, "inspired by a card I saw someplace, by someone I can't exactly remember who". I just feel better at least acknowledging that what I posted is not purely a product of my imagination. But I don't have a blog and only ( rarely ) post things into my gallery on Splitcoast. don't think it's really necessary to state where you got your inspiration, it's just polite, especially when there are obvious similarities. I find that I am often inspired by a number of ideas mashed together, and then it doesn't really turn out the way I pictured it in my head, so I make several changes until I arrive at something I'm happy with, which looks absolutely nothing like any of the ideas that theoretically inspired me! This is something which is always in the back of my mind. I agree with what many have already said especially when it comes to the myriad ways we are able to see inspiration & remembering what we saw & where its from. I never set out to directly copy ever but take snippets of inspiration but I always fear that one day my sub-conscious is going to see me recreate something I have seen before without realising it. My brain can be pretty foggy these days! I've been stamping for about 25 years & while my style has changed a lot over the years I still find techniques that are variations on what has been done before many years ago. So how far back can you go? Lovely card by the way! Lovely card and coloring, Joan! I think there is a big difference between being inspired by and copying. Even so, if it is possible, it is nice to give a nod to who or what inspired you. For all the reasons mentioned, including the fact that we may be inspired by multiple things, it is not always possible. If you do know where the inspiration comes from, it is courteous to say so; if you don't recall the exact source of inspiration, it can still be mentioned that you saw a card or project that inspired you. This is a natural part of the creative process and the creative community. Here is my take on the whole situation. I watched the video. While it was very nice, the only thing it has in common with your card is that they are multi-colored and contain cookies. So if I only saw your card and then was inspired to make a card from it, would I need to give credit to the original (which I had never seen), plus your card? And how far back would we go? Maybe Therese was inspired by someone's card to make her card....you see where I'm going? We would have to go back to the beginning of art, because everyone is inspired by something, even if it's subconsciously. I don't subscribe to a lot of social media, but let's pretend that one day I sit down to make a card. Out of my brain comes my creation. Let's pretend that I don't follow Joan Bardee's blog. But someone sees my card and they recall that Joan Bardee made a card that was very similar. Did I copy Joan's card? Why didn't I give her credit? Ummm, because I don't know Joan Bardee (we're still pretending, here). So, yes, it's very nice to acknowledge that you were inspired by so and so (if you know who inspired you), or you saw something somewhere that inspired you. But I don't know if you always can. Is this clear as mud? Beautiful card, by the way. LOVE your comment! So true!!! I'm going to go in a different direction here, and use Pinterest as an analogy: If I see a card on Pinterest and I want to keep it, I "heart" it. If, however, I see a card on someones blog and I pin it, I say who the artist is, what blog it was on and why I pinned it (great layout, lovely colors, wanna CASE it, etc. I don't have a blog so I don't post my creations, but I thought this was close enough to your question. Day late and a dollar short (and brining up the rear behind John and Robert ?!?) but how about this - Do unto others as you would have them do unto you. you can never go wrong with that advice. Ok I am probably last here but just my 2 cents. I think it is really nice to acknowledge where your inspiration came from. I remember writing some poetry in Jr High and my teacher explaining to the class that if you are writing something that was inspired by someone else you should always credit that person. However I also agree that it may be difficult to remember where exactly where the inspiration did come from. You could say something along the lines that the creation was inspired by the internet (or similar) even if you can't remember who/what/where. thanks! excellent point. all the comments are food for thought.